"Sir, it wasn't how you looked, it was how you smelled." 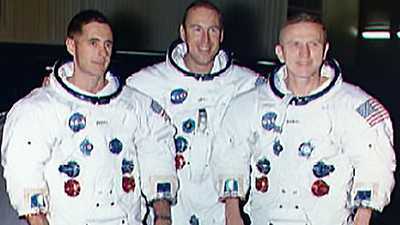 The Apollo 8 mission made history and its crew were rightfully honored as the bravest of explorers. Of course, these heroes were only human. They shared jokes and fun, moments of weakness, and the challenges of survival under difficult circumstances. 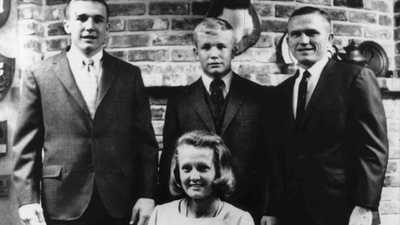 Read some insider stories from the Apollo 8 mission to the moon. "After we cleared the launch pad, now we were being propelled by the first stage in these five giant engines, building up thrust; thrust was constant but weight was decreasing, the weight of the vehicle. Since F=MA [force equals mass times acceleration], as M goes down, A goes up, and so, we were burning for about two and a half minutes and developing a thrust of about six Gs, being pushed back into our seats. "Then the giant first stage ran out of fuel, as it was supposed to. The engines cut off. Small retro rockets fired on that stage just prior to the separation of the stage from the first stage from the second stage. So we went from plus six to minus a tenth G, suddenly, which had the feeling, because of the fluids sloshing in your ears, of being catapulted by -- like an old Roman catapult, being catapulted through the instrument panel. "So, instinctively, I threw my hand up in front of my face, with just a third level brain reaction. Well, about the time I got my hand up here, the second stage cut in at about, you know, a couple of Gs and snapped my hand back into my helmet. And the wrist string around my glove made a gash across the helmet face plate. And then on we went. Well, I looked at that gash and I thought, 'Oh, my gosh, I'm going to get kidded for being the rookie on the flight,' because you know, I threw my hand up. Then I forgot about it. "Well, after we were in orbit and the rest of the crew took their space suits off and cleaned their helmets, and I had gotten out of my seat and was stowing them, I noticed that both Jim and Frank had a gash across the front of their helmet. So, we were all rookies on that one." "And so I'm watching it and Lovell's sitting next to me and it's drifting kind of like this and then it split. It oscillated too much and in the laws of conservation and momentum, see, that the one piece that's going this way has to be balanced by the other piece going that way, and so we watched it and as it headed towards Lovell -- thank God -- and he was almost out of focus watching this thing splat onto his chest and spread out like a fried egg. So we spent, you know, a couple of hours going around the spacecraft with kind of paper wipes, like butterfly catchers trying to catch butterflies, mopping this stuff out of the air or off the walls. "It was bad. You know it's amazing, after a while you didn't smell it. Not because the smell went away -- 'cause you get used to it. I guess a skunk can learn to live with himself." A frequent question about space flight involves human waste. For urine collection, the Apollo command and service module was equipped with a hose that led, through a valve, to outer space. After the condom-like attachment on the end of the hose was rolled on, the astronauts had to time the opening of the valve just so. Too soon, and the vacuum of space would begin pulling -- and the equipment would jab at their private parts, making it hard to urinate. Too late, and some of the urine would escape into the cabin, floating around in golden spheroids. When the device was properly used, the urine would be sucked into space, and freeze instantly into iridescent drops of ice. When asked "What's the most beautiful sight you saw in space?" one astronaut answered, "Urine dump at sunset." As for the solid waste, the equipment resembled, in author Andrew Chaikin's words, "a top hat with an adhesive coating on the brim. Each bag had a kind of finger-shaped pocket built into the side of it." After fixing the sticky side to your bum and doing your business, the finger pocket was used to direct the waste away from your body -- after all, without gravity, the waste wouldn't fall. Then, a blue germicide had to be sealed into the bag and kneaded into the waste to fully mix the contents. To help matters, NASA developed special food that would produce as little waste as possible. Once the mission for Apollo 8 was reconfigured, the capsule would be scheduled to land in the Pacific just after Christmas 1968. American troops were fighting in Vietnam and the Navy was planning to give Christmas leave to as many sailors as possible. But to retrieve the capsule, NASA required the cooperation of the Commander in Charge of the Pacific fleet (CINCPAC). NASA's director of flight operations during most of the Apollo missions, Chris Kraft, had the responsibility to convince CINCPAC to allocate ships and men to recover the Apollo astronauts and their spacecraft. In Hawaii, Kraft addressed an amphitheater full of captains, admirals and generals from every branch of the military. The man he had to convince was Admiral John McCain, CINCPAC, whose fighter pilot son was being held as a Vietnamese prisoner of war. "Neither before nor since have I stood in front of that kind of high-powered audience. McCain's eyes only left my face to look at my charts and graphs. I don't remember many of my exact words. I simply ran through the mission and told him what we wanted to do. I know that I stressed the importance of the flight and its risks, and that the greatness of the United States of America was about to be tested in space. "There was complete silence in the room for maybe five seconds. McCain was smoking this big long cigar, and all of a sudden he stood up and threw it down on the table. "We hit the water with a real bang! I mean it was a big, big bang! And when we hit, we all got inundated with water. I don't know whether it came in one of the vents or whether it was just moisture that had collected on the environmental control system. ... Here were the three of us, having just come back from the moon, we're floating upside down in very rough seas -- to me, rough seas." Borman had argued for a night landing to reduce the number of orbits around the moon and decrease the risk of anything going wrong. Because of the timing, they had to wait an hour and a half until dawn before Navy helicopters would drop frogmen into the water and recover the astronauts. Borman: "Of course, in consternation to Bill and Jim, I got good and seasick and threw up all over everything at that point." "And I did notice a very strange odor when I got out of the spacecraft and it turned out to be fresh air." Apollo 8 commander Frank Borman was a stickler for protocol. As long as things had worked before, he saw no reason to change them. He argued for fewer orbits around the moon, and fewer experiments (the goal of the mission, after all, was just to orbit the moon and return; everything else was superfluous). He argued (unsuccessfully) against taking a television camera on board and he even argued against a special "wet" Christmas dinner -- different from the freeze-dried food they had been eating on the rest of the mission. But that didn't mean the spacecraft was free of non-regulation gear. "I also was carrying in my gear a number of special 'Snoopy the Astronaut' pins designed by cartoonist Charles Schulz," Borman admitted in his autobiography. Snoopy had become the symbol of the Apollo program: the likeness of the ingratiating cartoon beagle was on posters adorning the walls of hundreds of factories and NASA offices, some of them carrying the admonishing words: 'It will not be one man going to the moon ... it will be an entire nation.'" Borman was not the only "Peanuts" fan at NASA. The Apollo 10 command module was called Charlie Brown and the lunar module, Snoopy. Apollo 8 commander Frank Borman once commented, "None of us, to my knowledge, ever got claustrophobic in a spacecraft. It's totally different than being claustrophobic on earth. Because here on Earth we usually, when you're trapped in something, what's good is on the outside. In a spacecraft, what's good is on the inside and what's outside is death." The women who married fighter pilots or test pilots understood that their lives could be shattered in an instant. 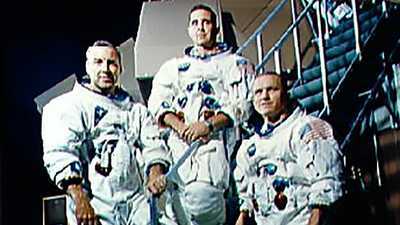 The success of the Apollo 8 mission in December of 1968 was a triumph that the nation and the world could appreciate. They were not reckless, but understood the risks involved in their profession and worked to minimize those risks to an acceptable standard.